^ Geddes, Patrick. Cities in Evolution. London: Williams & Norgate. 1915 –通过Internet Archive. ^ Gottmann, Jean. L'Amerique. Paris: Hachette. 1954. ^ Gottmann, Jean. 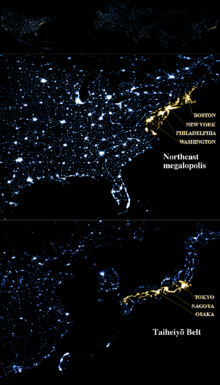 Megalopolis, or the urbanization of the Northeastern Seaboard. Economic Geography. 1957, 33 (3): 189–200. JSTOR 142307. doi:10.2307/142307. ^ Gottmann, Jean. Megalopolis. The Urbanized Northeastern seaboard of the United States. New York: The Twentieth Century Fund. 1961. ^ Fielder, W.; Feeney, Georgiana. Inquiring about Cities: Student text. Holt, Rinehart and Winston. 1976: 193, 299 [2018-06-25]. ISBN 9780030897849. （原始内容存档于2018-06-25） （英语）. ^ Gottmann, Jean. Since Megalopolis. The Urban Writings of Jean Gottmann. Baltimore and London: The Johns Hopkins University Press. 1989: 163. ^ 8.0 8.1 Taylor, Matt. Megaregions. America 2050. [2017-04-06]. （原始内容存档于2017-05-16）. ^ 10.0 10.1 Cities: Capital for the New Megalopolis 互联网档案馆的存檔，存档日期2013-08-27..Time magazine, November 4, 1966. Retrieved on July 19, 2010. ^ America 2040: The Rise of the Megapolitans (PDF). January 2007 [2014-01-05]. （原始内容存档 (PDF)于2013-07-24）. ^ Tremble, Sam. Fumbling Toward Portland. Philadelphia City Paper. May 30, 2007. （原始内容存档于July 7, 2009）. World Urbanization Prospects: The 2005 revision (PDF).